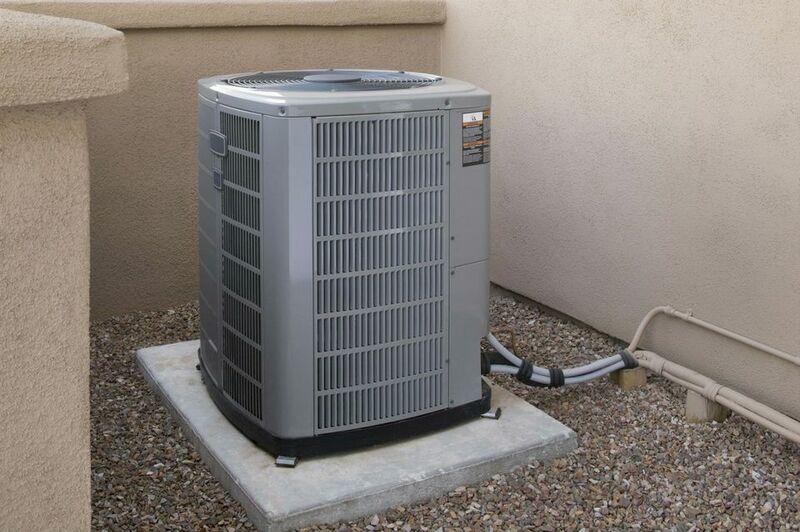 Central air conditioners rely on fans to pull air through the condenser coils in order to dissipate heat. These fans are subject to outdoor conditions and plenty of dirt and grime. While most current models of air conditioners have motors that don't need to be oiled, many older units require periodic oiling to keep the fan in good condition. Oiling is recommended at the beginning of every cooling season. This is also a good time to inspect the fan blades and motor for signs of wear. Warning: A/C compressor/condenser units have high-voltage capacitors that store deadly amounts of electricity even after the power is turned off. Do not reach down into the unit unless you know exactly where the capacitors are and how to discharge them safely. Every A/C unit is different, so follow the manufacturer's instructions for oiling your model. Use a high-quality oil designed for high-speed motor shafts and bearings. Do not use oil containing a detergent, such as automotive motor oil. Detergent is bad for the bearings of fan motors. Turn off the power to the system at the disconnect switch and/or the A/C system breaker in the breaker box. Remove the top cover of the compressor/condenser unit (the outdoor cabinet). The motor is mounted to the underside of the cover. The cover is usually secured with 8 or 10 screws along its perimeter. Remove these with a nut driver or screwdriver. Some units have fans that are secured to the fan cage; in this case, you simply remove the screws holding the cage to the unit cover. Turn the cover or cage assembly upside down to access the oil ports on the motor. These ports will be located on the top and/or bottom of the motor. Inspect the fan blades and motor (see below). Remove the plug covering each oil port. You should be able to pull out the plugs with your fingers or use a small flathead screwdriver to pry them out. Squirt a small amount of oil into each port until the oil starts to spill out of the port. It helps to have an oil container with a small hose or nozzle. Wipe up any spilled oil with a rag. Reinstall the plugs into the ports. Spin the fan blade slowly by hand to disperse the oil within the motor. Reposition the unit cover or fan cage and secure it with its screws. Restore power to the unit. While your fan is positioned with the blades facing upward, spin the blades with your hand to make sure the motor shaft moves smoothly. Next, grasp the blade assembly near its center and try to jiggle the motor shaft back and forth and up and down. A little up and down movement is normal, but there should be no side-to-side movement. If there is, and you've noticed your fan is louder than usual, it's probably time to replace the motor; the bearings are worn out. Finally, check each blade for cracks or other damage. If you see any problems, replace the blade assembly. What is the Correct Method to Straighten Crooked Electrical Outlets?